Like most states, Oklahoma has laws that restrict cell phone use while driving in an effort to reduce distracted driving accidents. Oklahoma is also like most states in that many drivers either don’t know the applicable distracted driving laws or choose to ignore them. Nationally, distracted driving is believed to be a factor in about 10 percent of all fatal motor vehicle accidents and nearly 20 percent of all crashes that result in injury. According to the Oklahoma Department of Public Safety, 11 fatal crashes and 662 injury-causing crashes involved a driver distracted by an electronic device in 2016. Texting while driving is a primary offense in Oklahoma. In 2015, Oklahoma became the 46th state to ban texting while driving. The Oklahoma law prohibits texting and some other forms of electronic communication—such as taking photos or video and posting to social media—while operating a motor vehicle. Texting behind the wheel is now a primary offense in Oklahoma, which means law enforcement can pull over and cite drivers they witness texting even if the drivers have not committed other traffic violations. The first offense results in a $100 fine. The law prohibits all drivers from texting, but it also bars drivers with permits or graduated licenses from handheld phone use behind the wheel. Adult drivers are still able to use their phones to make calls with or without hands-free equipment. Distracted driving isn’t a new problem, but the dangers have grown exponentially as smartphones become more widespread and tech-obsessed teens take the wheel. Cell-phone use and texting are the leading causes of driver distraction. 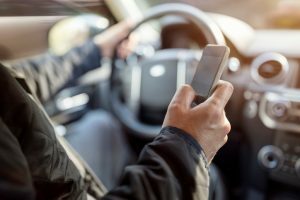 When it comes to assessing the extent of distracted driving, Oklahoma’s data collection protocols are somewhat limited. Currently, law enforcement is only able to distinguish certain types of information such as the use of a cell phone versus the use of a navigation device versus a distraction other than an electronic device. Crashes involving distraction by an electronic device occur most often between the hours of 4 p.m. and 8 p.m. Despite the new law, in 2016 fatalities and injuries related to distracted driving accidents increased. Distracted driving is a risk on par with drinking and driving. According to the National Highway Traffic Safety Administration (NHTSA), people who use a cell phone (either handheld or hands-free) behind the wheel experience the same impairments to response time as drivers with a blood-alcohol concentration (BAC) of 0.08 percent (the legal threshold for drunk driving). Distracted driving is not limited to cell phone use and texting. A driver who uses a cell phone behind the wheel is four times more likely to crash than a driver focused on the task at hand. And drivers ages 16 to 24 are most likely to use a handheld device while driving. In 2015, nearly 3,500 Americans were killed and approximately 400,000 were injured in motor vehicle crashes involving distracted driving. While cell-phone use in general and texting in particular receive the most attention, distracted driving comes in many forms. If you were hurt or a loved one was killed in an accident that may have been caused by a distracted driver, the Oklahoma injury lawyers at Carr & Carr Attorneys at Law are here to help. Our attorneys have extensive experience helping car accident injury victims pursue the financial security they need to cope with medical expenses and move forward with their lives. Please call us today at 877-392-4878 or contact us online for your free consultation. We serve clients throughout Oklahoma via offices in Tulsa and Oklahoma City. For more information about Oklahoma legal matters, “like” Carr & Carr on Facebook!